Abstract: We contribute to the MIS education literature by empirically examining Web log server data generated by undergraduate students enrolled in multiple sections of a MIS course where an online Learning Management System (LMS) was used to complement a traditional classroom environment. We identify online learning styles by investigating differences in LMS usage patterns, finding four distinct usage patterns as well as differences in the level and variation of LMS usage by male and female students. 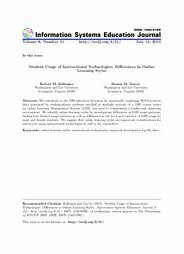 We suggest that online learning styles are important considerations for instructors using instructional technologies as well as for researchers.